Shidare takes her snacks very, very seriously. Capture from the Funimation stream. Kokonotsu Shikada dreams of becoming a manga artist. His father, Yō Shikada, the eighth family owner of his candy shop, wants his son to become the ninth. 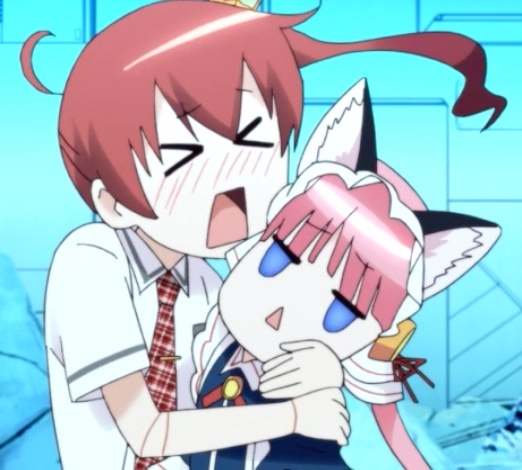 Kokonotsu adamantly refuses to even consider it. One day, Hotaru Shidare shows up with a request from her father: will Yō join her father’s company? Apparently, Yō is famous for his snacks, and Shidare’s father would like them to join forces. He agrees on one condition: that Shidare first convince Kokonotsu to take over the store. Then he’ll gladly join her father’s company. There’s a lot of funny lines in the first episode, and many of them come from Shidare. She’s already a bit of an internet sensation. Sites like Deviant Art have published a lot of fan art featuring her, and her character is beautiful. Wacky, too — I think she’s eaten too many sweets. She has a far-ranging imagination, loves sweets, and seems to have few inhibitions. Kokonotsu is obviously interested in her, but Shidare has a rival in Kokonotsu’s friend’s sister, Saya Endō. Endō is shy around Kokonotsu, but she’s really strong and has no problem pounding her older brother into submission when he teases her about Kokonotsu. I liked the humor and character design (Shidare in particular). I think this is going to be a lot of fun to watch. Yurizaki really seemed to feel guilty that she couldn’t avoid violence and obey her father. Capture from the Funimation stream. Dimension W takes place in a future where gasoline is almost a hundred dollars a gallon. The reason? A genius scientist named Shidou Yurizaki developed “coils” that draw unlimited energy from dimension W. The scientist is missing, though the technology based on his work drives most of the electrical needs for the entire planet. Not all of the coils in use are legal, and the underworld buys a lot of counterfeit coils. Kyouma Mabuchi is a Collector who specializes in retrieving illegal coils. He goes on a mission and is trying to subdue the thugs when he encounters Mira Yurizaki, who the bad guys had taken hostage. She knocks the last thug unconscious, walks up to Mabuchi, calls him a low life, and slaps him so hard he falls unconscious. He doesn’t come to until later. Not one to give up on a bounty, Mabuchi finds her again and this time, uses his wired blades to subdue her. That’s when they both notice a strange light in the distance, and Yurizaki becomes frantic to get loose and return to her father. Turns out the authorities had finally found the genius scientist, who had repented of the work he had done and was trying to undo it. To protect his work, he creates what looked like a singularity that consumes him. The blast shutdown all of the coils in the vicinity, including the one that powered Yurizaki. When she wakes up, she in Mabuchi’s employer’s lab. She asks them to stop calling her a robot because “I’m a girl, you know.” Then, remembering that her father is dead, she begs them to let her help gather illegal coils. The animation is gorgeous. I really like both of the main characters (Mabuchi and Yurizaki). Both are very expressive and both feel multidimensional. The world’s fascinating. I thought the animation was detailed and fluid. Apparently, there’s something very wrong with the coils and how they pull information from Dimension W, and I’m looking forward to finding out what. They all try to work together. Moguzo cooks, and Yume takes the lead in taste testing. Capture from the Funimation stream. A group of humans wake up in a medieval world. They don’t know it’s medieval; they have no memories, but they retained their language. They awaken in a dark place that they find out was the inside of an obelisk. There was a variety of age groups and a mix of men and women. 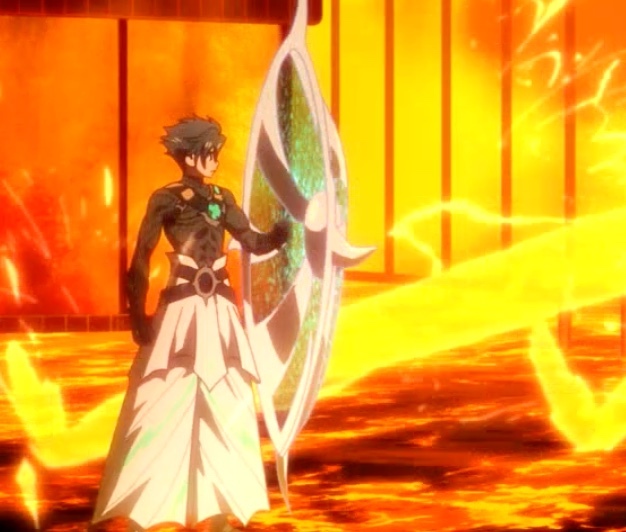 Two men in armor take them to a tavern where a man, obviously strong and cunning, welcomes them to Grimgar. He introduces himself as Brittany, chief and host of the Red Moon office. He tells them that if they want to earn their keep, they have to join the Volunteer Soldier Squad in hopes of being accepted into the Borderland Brigade. Finally, he sets their expectations: if they’re not strong enough, they will die. If they want to live, they have two choices: kill monsters to sell their parts, or become a special “pet” of Brittany’s. He gives them all a little money to get them started. Some of the stronger people form a group and begin exploring. Some of the apparently less strong form a group, too, and become our main characters. They join guilds like the thieves’ guild, the magician’s guild, and the hunter’s guild to hone their skills and find work. However, no matter how much they practice, they can’t even kill a single goblin, the weakest of Grimgar’s monsters. After 13 days, their money’s about run out. Grimgar has a likable ensemble cast. 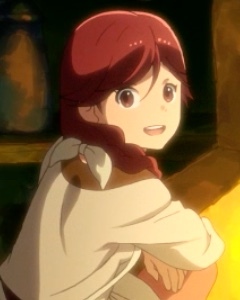 One of the main character is Haruhiro, who trained under Barbara to join the thieves’ guild. Ranta’s a braggart who’s trying to put the best face on a bad situation. Manato, who joined the cleric’s guild, serves as the team’s leader. Yume’s the team’s hunter (and top taste tester), and Shiroru is their magician. The latter two are women, and they seem to have already attracted a following on Twitter and other social media. Finally Moguzo is the team’s warrior and cook. The backgrounds and scenery are beautiful. They look like high-quality water color paintings. The wildlife has amazing details — like the muskrat-looking creature that ate some of their leftovers as the main characters were camping. One of the little babies stopped and rolled over to show its adorable tiny feet. Those kind of details delight me. Tsurugi is formidable when he and Athena join their Logic and Luck. Capture from the Funimation stream. Yoshichika Tsurugi is a high-schooler living at home with his little sister and father. Their world suffers incursions from demons fleeing a conflict in their home dimension. Some humans possessing “logic” form pacts with goddesses from that other world to fight the demons, and so the human race is preserved. Tsurugi used to be Logicalist before he lost his logic in a battle where he violated orders and tried a forbidden technique. Now he’s a civilian just trying to get by. While he’s getting ready to go to school, the goddess Athena finds his Logic, which had just washed up on shore. She’s been looking for it for a long time, and having obtained it, sets off to find him. In the meantime, a huge demon attacks, and the Another Logic Counter Agency (ALCA) sends its agents to intercept. Civilians like Tsurugi and his family scurry for the shelters. Athena finds him and tells him what she found; his sense of honor forces him to accept not only his logic, but her office of a contract. Just as the ALCA agents are about to be overwhelmed, Tsurugi and Athena arrive, engage the demon, and coordinate the defense until the demon calls. He’s recruited back into the ALCA (much to the dismay of his sister), and he begins training with them. I enjoyed how Luck & Logic portrayed the demons. They remind me of ancient Japanese gods in angry form. I think Tsurugi’s going to work as a main character, and I’m already curious to see why Athena spent so much energy searching for him. One thing that alarms me is that the other ALCA agents are all female; I hope this doesn’t devolve into a typical harem series. I’m not against those; I just like to see something else every now and again. Nanakorobi really, really likes Clarion. I mean, it’s almost unhealthy how much she likes Clarion. Capture from the Funimation stream. I’m not sure how to feel about this one. In the beginning, Nene Nanakorobi is taking a cruise ship to the island city named Cenancle to live with her aunt. Nanakorobi is human, but most of her body is robotic. She meets Uzal Delilah, who seems like some generic rich traveler but who is actually some kind of evil (or at least manipulative) scientist. She’s traveling with her artificial maid named Clarion, and Nanakorobi immediately falls in love with her because she has kitten ears. They agree to meet after Nanakorobi settles in with her aunt, but on the way, something strikes the city so hard that some buildings collapse. Though Nanakorobi doesn’t know it, the oppressed occupants of Delilah’s lab are rebelling, and their attempt went out of control because of traps Delilah had built into the system. Nanakorobi finds Delilah and Clarion and, thinking they’re in danger, tries to help them. Delilah doesn’t let on that she’s the cause of the strife and uses Clarion to reprogram some of Nanakorobi’s firmware so she can help defend them. Of course, the reprogramming involves Clarion lifting her dress so Nanakorobi can stick her finger into a compartment just below Clarion’s belly button. No, not that far down, but far enough! Of all the shows in this list, I think this one has the most plain animation. 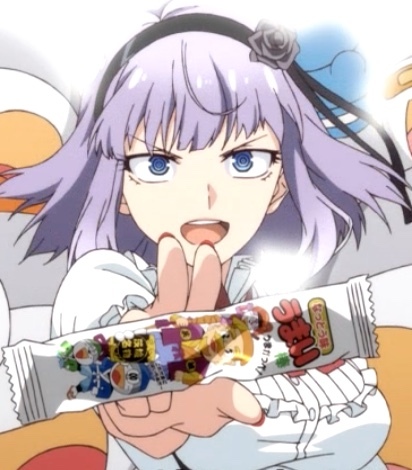 It doesn’t haveDagashi Kashi’s whimsy, Dimension W’s fluidity, Grimgar’s artistic appeal, or Luck & Logic’s fanciful combat. But I thought Nanakorobi’s innocence was attractive, and I’m wondering if Delilah will evolve into a real villain or if we’ll come to understand something about her lab’s subjects that absolves her. I’ll just have to wait and see!